If you’re looking for relaxing holiday cottages, Herefordshire is a lovely destination. The villages and market towns in this county are quaint and free from the stresses of big city life. Take the time to slow down, get away from it all and experience all the natural beauty and fascinating history this area has to offer. Whether you unwind by perusing Tudor houses, making use of one of the walking and cycling trails or marvelling at the gorgeous limestone gorges and woodlands, staying in one of our charming, idyllic and picturesque cottages in Herefordshire will give you the ideal base to experience it all. If you want to breathe in fresh country air, gaze at the Malvern Hills and the Wye Valley, dip your toes in the River Wye, wander around a traditional town or simply have a moment to yourself in one of our rejuvenating holiday cottages, Herefordshire is the ideal place to be. We’re in love with our cottages – and we know you will be too. We know our properties inside and out, and are dedicated to helping you find the perfect one to stay in during your peaceful, pastoral getaway. Come, recharge your batteries and return to the simpler things in life. 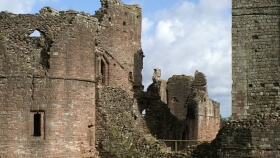 The traditional market towns and villages of Herefordshire, such as Ledbury, Leominster and Hay-on-Wye, are known for being quaint and charming. 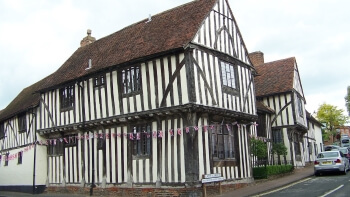 Whether you’re looking to support one of the many independently-run businesses the area has to offer or are just looking to view the Tudor cottages, it’s easy to slow down and smell the roses in these perfectly relaxed towns. For natural beauty unlike any you’ve seen before, take a walk or a cycle ride through the Herefordshire countryside. 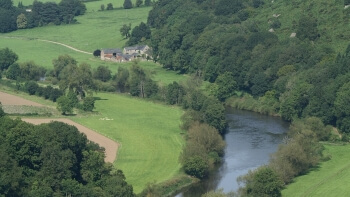 Watch as the mighty River Wye flows past you, feel yourself become inspired by the gentle hills of the Golden Valley, or just bask in the sheer wonder of the untouched woodlands and striking limestone gorges. Stunning views await. With its mansions, country estates, medieval castles and holiday cottages, Herefordshire is filled to the brim with history and heritage. 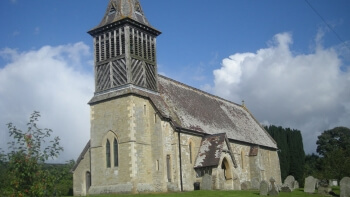 However, the sites it is best known for are Dore Abbey (originally a monastery from the twelfth century, now a church) and Arthur’s Stone (a Neolithic burial monument). For amazing architecture and stunning stained-glass windows, take a trip to this eleventh-century cathedral. You will also find an enormous medieval map of the world known as the Mappa Mundi and the Chained Library, with its books manacled to the shelves like eternal prisoners. The Tudor cottages in Herefordshire are some of the best in the country – and you can see them by following the Black and White Trail. 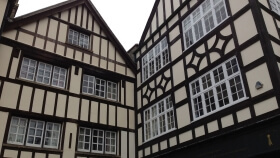 Their wooden framework is visible on the outside of the building, a type of construction known as half-timbering and one that gives them their distinctive black and white colouring. 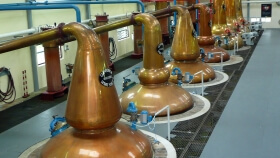 There’s no better way to relax than with an adult beverage, and you won’t find potato gin, vodka or cider better than that produced at the family-run Chase Distillery – and it’s all made onsite. Make sure you take a tour and try some samples. Originally built as a means of protection for the most important crossing point on the River Wye, this medieval Norman castle is now an impressive historical site to visit. Much is still completely intact and, with its gorgeous views and imposing atmosphere, this is a breathtaking building. For more information on our properties or details on how to book, get in touch with one of our dedicated team members by calling 01275 371133. 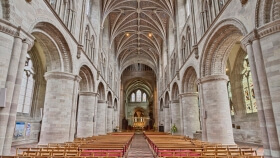 Explore the history and heritage of Herefordshire with visits to these amazing attractions. With Neolithic burial mounds, humble Tudor cottages, and magnificent medieval cathedrals, you're sure to find something to spark your imagination as you step into the past in this beautiful county.